Jack Galvin dominatated the Premier class at Desertmartin. The stars of the future lined up last Saturday at Desertmartin for the opening round of the new-look HTM Ulster Youth Championship. The action on track matched the effort by the Cookstown Club who promoted the meeting and the MRA who have worked tirelessly to put together a package that rewards the competitors for their efforts perfectly. With an entry of over 120 competitors, each class produced some fantastic performances. In the premier 250cc class Jack Galvin from Cork had no equals, qualifying his 250f Yamaha fastest and rattling off three convincing wins well clear of his nearest rival Conor Mullan. In his opening race he powered the Yamaha to a gate-to-flag victory and had just over eight seconds to spare over Mullan with Ben Hall third. Race two was a demolition job with over 20 seconds to spare over second place Mullan at the chequered flag and in his third and final outing, he was over half-a-minute ahead at the finish, despite a slow start by his standards that saw the teenager ending the opening lap in third place. By the end of lap two he was in front and the race was all but over with the 17 year-old completing a clean sweep on the day. 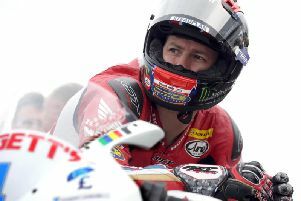 “It was hard going in the first race as the track was so smooth and everyone was on the same speed but as the track roughened up I was able to pull a bigger gap and get away in my next two races,” he said. He finished fourth overall in the opening Irish championship round at Munster a couple of weeks ago and now leads the Ulster youth championship so his season is certainly going to plan. 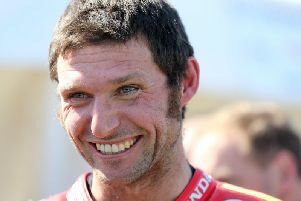 In the last couple of years Galvin has raced in the British championships but it is not in his plans so far in 2019. “As this is my first year on the 250 I’m not sure what to do,” he said. In the 125cc intermediate class Niall Cregan from Donaghcloney was another convincing winner, with three wins from three starts on his Husqvarna. Race one saw the teenager finish over a minute clear of Ross Kearns while it was Jack Moore who filled the runner-up slot in race two after bike problems ruled him out of race one. It was the same result in race three with Cregan winning from Moore. The youngest riders on the day were in the 50cc Automatic class and it was a delighted Magherafelt schoolboy Hayden Gibson who left Desertmartin with the spoils of victory after qualifying fastest and taking three convincing wins on his GAR Husqvarna. It was the eight-year-old Magherafelt Primary School pupil’s sixth win on the trot at Desertmartin. The youngster is only in his second season of racing and looks to be a star of the future if Saturday’s performance is anything to go by. He wrapped up his second treble in three weeks with ease as he cruised to victory in the Desertmartin sands. “I really enjoyed the day. I only started racing last year and have a lot more confidence this year,” he said. Second to Hayden Gibson was six-year-old Ethan Gawley, son of former 125 Ulster short circuit Champion Darren Gawley. It was Ethan’s first ever Ulster Championship race and he was delighted to finish on the rostrum. Finishing second in races one and three was a great achievement. “It was great to finish second overall but I was disappointed to only finish fourth in race two,” he said. “I was lying second behind Hayden (Gibson) and made a mistake near the end and crashed. I got going again but lost some places to Kyle Graham and Nathan Austin.